UK HB slipcased collectors' first edition. Book will be shipped on publication day. ﻿Synopsis : ﻿The translation of Beowulf by J.R.R. 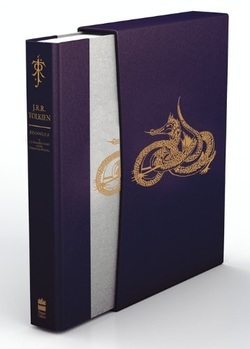 Tolkien was an early work, very distinctive in its mode, completed in 1926: he returned to it later to make hasty corrections, but seems never to have considered its publication.This edition is twofold, for there exists an illuminating commentary on the text of the poem by the translator himself, in the written form of a series of lectures given at Oxford in the 1930s; and from these lectures a substantial selection has been made, to form also a commentary on the translation in this book. Sellic Spell, a ‘marvellous tale’, is a story written by Tolkien suggesting what might have been the form and style of an Old English folk-tale of Beowulf, in which there was no association with the ‘historical legends’ of the Northern kingdoms..